I came across a wonderful web site that describes what the author considers the best rides in Oregon and California. And Ride Oregon has a great page where you can find rides of any type and length wherever you are in Oregon. In general, Oregon drivers are amazingly courteous and friendly. The roads are usually very good, perhaps the result of Oregon being a very community-minded state. Portland is not a particularly good place for cycling unless you enjoy urban cycling. However, there are plenty of rides in the city, and cycling is a great way to explore it. Unless you are just exploring or are riding with a local, you’ll need maps and directions. I had to look at my map and directions many times and I still got lost and still had to backtrack. There are a few big rides outside the city but they typically quite a distance away, and despite the proximity to beautiful Mt Hood, they have no views because there are too many damn trees in the way. But if you want to ride in the Portland area, here is a good web site that describes “great rides around Portland“. And here’s another web site that describes the “best rides around Portland“. I rode a couple of rides from these pages that were fun: Short, Steep, & Sweet, and the Lake Oswego Loop. A rather strange climb of 17.9 miles with 4,061 feet of climbing. Drive along I-84 to exit 22 to Corbett. The full ride starts just after you leave the Interstate. The first 1.2 miles are very steep, gaining over 600 feet. At the top, turn left and follow the road for about 1.5 easy miles to the Portland Women’s Forum viewpoint on the left. Many people park here to start the ride. A few hundred yards further on the road splits, with the right-hand road signed for Larch Mountain. Ride this for about 14 miles through the forest to the parking circle at the top. I found this section rather boring as it has no views and is never very steep (it even has some downhill in the early miles). As described by Summerson, this climb is 13.7 miles with 3,142 feet of climbing. However, my experience was very different and I recorded only 2,407 feet of climbing. Nor did I find it hard enough to rate a 1/2. 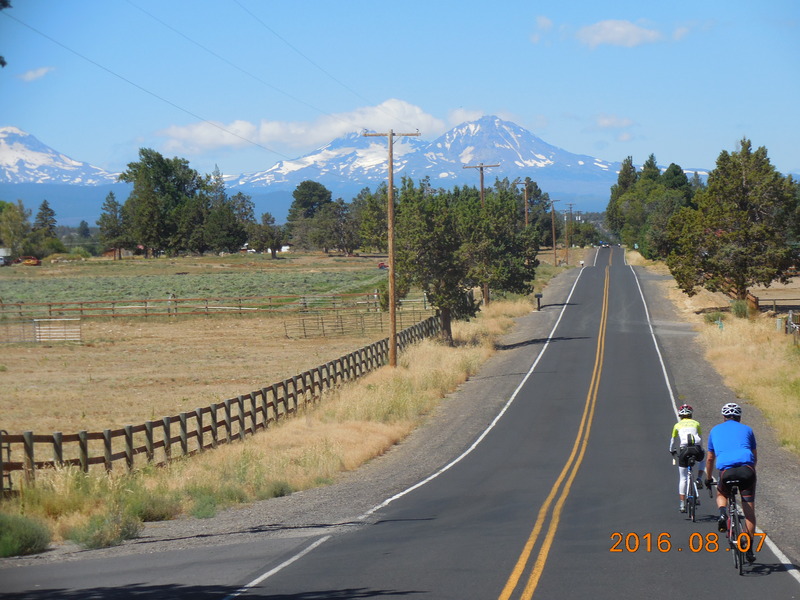 The ride is a long way from Portland, and while it’s close to Mt Hood, you get almost no views of the mountain. Take exit 64 off I-84 at Hood River and drive south on Hwy 35 to the tiny town of Mt Hood. Five miles further on the road crosses the East Fork of Hood River. Park just before the bridge – there’s a good asphalt pullout on the left. The climb varies between moderately steep and false flats, with some slight downhill thrown in. The shoulder is good and there’s not too much traffic. Despite views of Mt Hood as you drive towards the start, you get no views as you ride until you reach the bridge at the very end of the ride. For the best views, exit right just before the bridge and ride up onto the bridge. Interestingly, the views are better on the way down as you are closer to the river, and the cliffs are angled such that you see them on the way down but not on the way up. The area around Bend has some wonderful rural riding, but it helps to know a local cyclist to show you around. The one ride that is well documented is the Twin Bridges ride, which will give you a taste for what is available. In general the roads are very good, and often have very good shoulders. 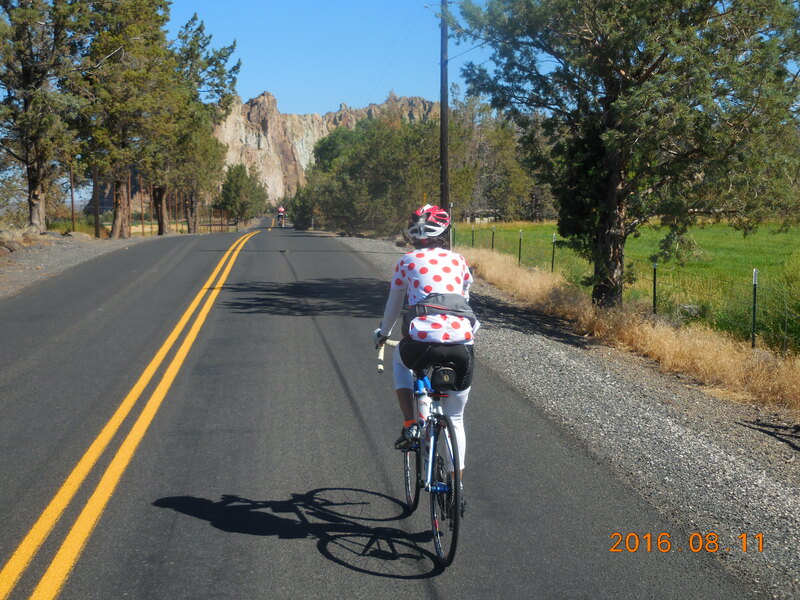 Further north, near Redmond, there’s more great riding out towards the world-famous rock climbing area of Smith Rock. There is also a lovely 5-mile ride up Redmond’s Dry Canyon, which has a beautiful bridge on which people climb. The city of Bend itself has lots of very good urban cycling, which feels less urban than rural because everything is so spread out. The good riding tends to be on the south-west side of town. If you are looking for some steep close-in climbs, try the 1.1 mile climb up Pilot Butte, or either 9th and 12th Street up Awbrey Butte. 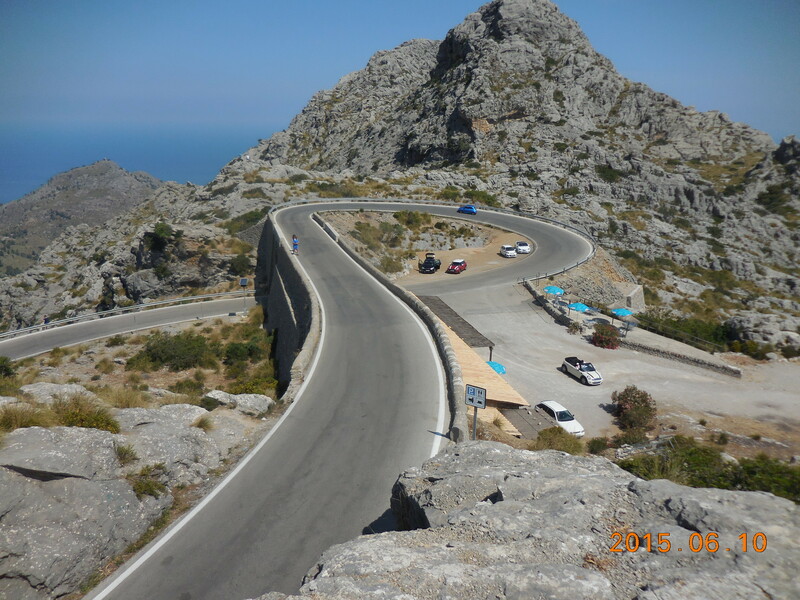 For a close-in longer climb, try the more gentle 10 mile climb up Skyliners Rd. If you like to eat croissants for breakfast, The Sparrow Bakery has good ones. The roads are good, there are plenty of rollers, and once you are outside Bend the traffic is very light. The lollipop portion of the ride is usually done clockwise and there are signs by the road that tell you where to turn; however, you may find a map and ride directions useful. Summerson says this is probably the hardest climb in the Bend area. It’s not particularly worthwhile unless you are looking to do the hardest climb. Head south from Sisters on S. Elm Street for three blocks and park by the park. Ride south for 13.9 miles to where the road turns to dirt, with 3,075 feet of climbing. The climb has a sting in its tail, with two sections of 9% near the top. Traffic is usually light. 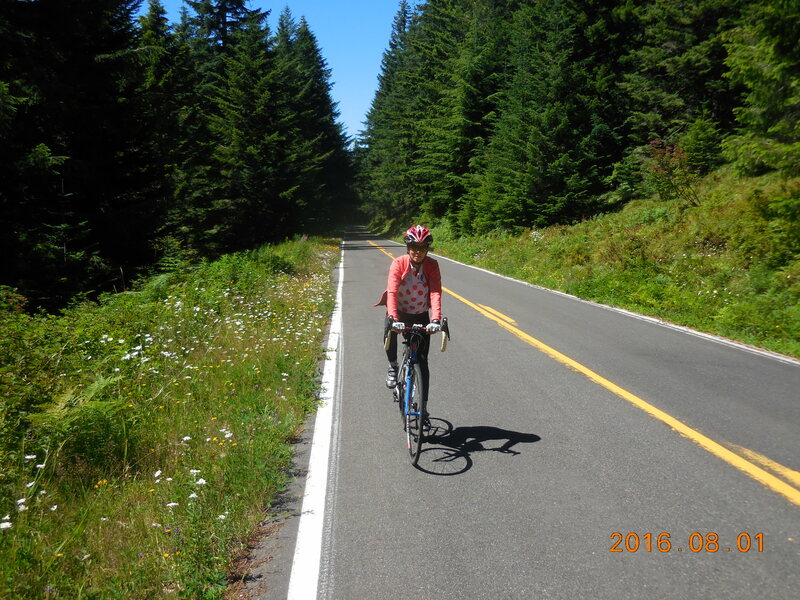 The west side of McKenzie Pass (S-2) is an amazing ride, mainly for its scenery which starts with your typical thick Oregon forest and ends with three miles of Hawaiian lava field. The east side ride is mainly just a way to get to the west side. The east side road is also busier than the west side. Neither side has any real shoulders. The whole ride is about 58 miles with 5,600 feet of climbing. The east side is 7.5 miles with 1,580 feet of climbing, while the west side is 21.5 miles with 3,820 feet of climbing. The rest of the elevation gain is from rollers, mainly on the west side. From Sisters, drive west on Hwy 242 towards McKenzie Pass. After 6.9 miles park in a large parking area on the right, just before a sign that warns you of the narrow road ahead. Alternatively, ride from Sisters, which will add about 14 flattish miles to the trip. Ride to the top of the pass, at an elevation of 5,325′. You will be in an incredible lava field, with an interesting lookout building, the Dee Wright Observatory. 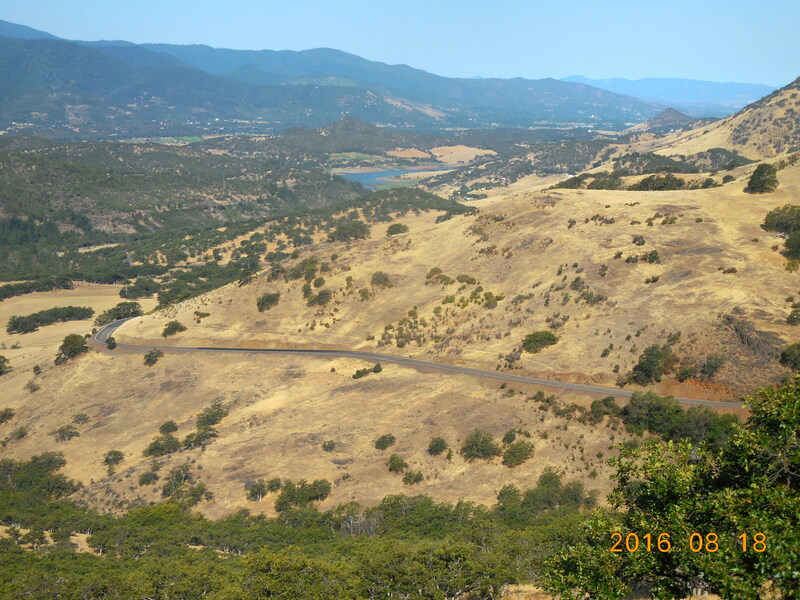 Ride down the other side, rolling for the first few miles, then lovely switchbacks through the forest, then a few miles of easy terrain to the intersection with Hwy 126. Turn round and ride back up. About 14 miles from Hwy 126 the true climb finishes and you begin about 7 miles of rollers. 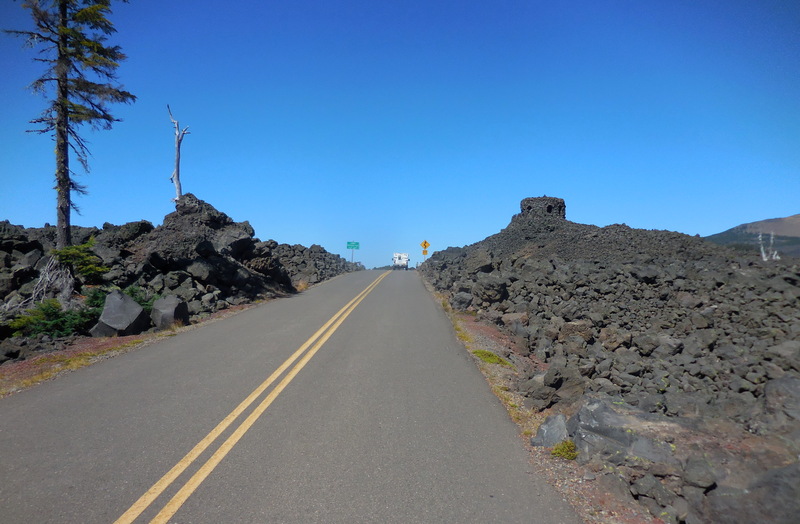 In 4 miles you enter the lava field, which you ride through for about 3.5 miles. Then descend the east side to your car or Sisters. 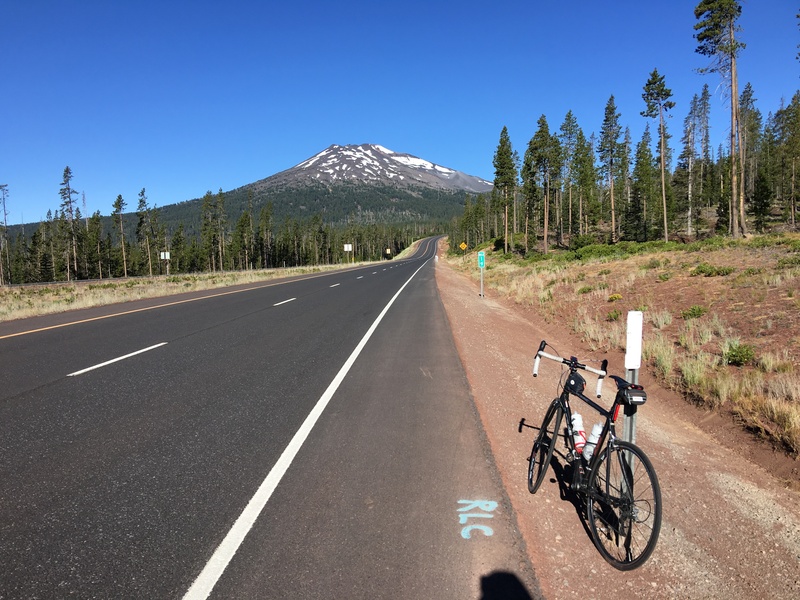 A great loop on wonderful roads with good shoulders, and with some excellent views of the mountains – Mt Bachelor in particular. It is about 85 miles with 5,300 feet of climbing. Traffic is not too bad during the week, although the roads lend themselves to cars being driven at high speeds. Weekends can see a lot more traffic going to the various lakes. 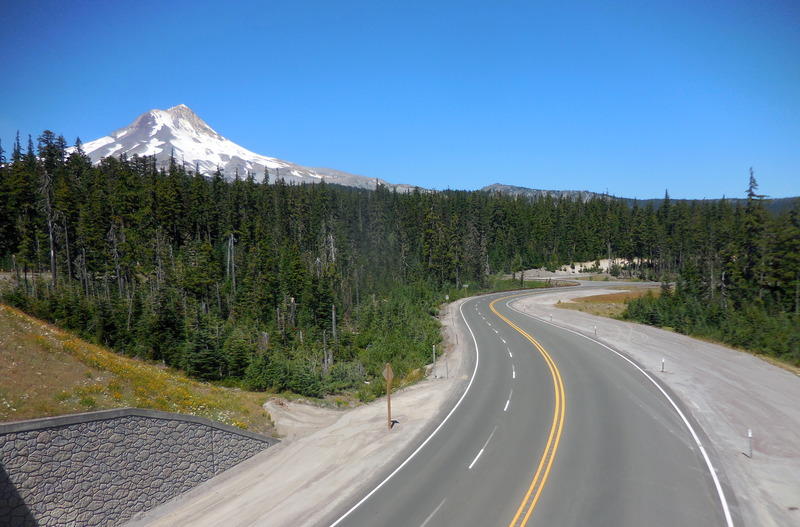 Start in Bend and head up the Cascade Lakes Scenic Byway (Century Drive) towards Mt Bachelor. 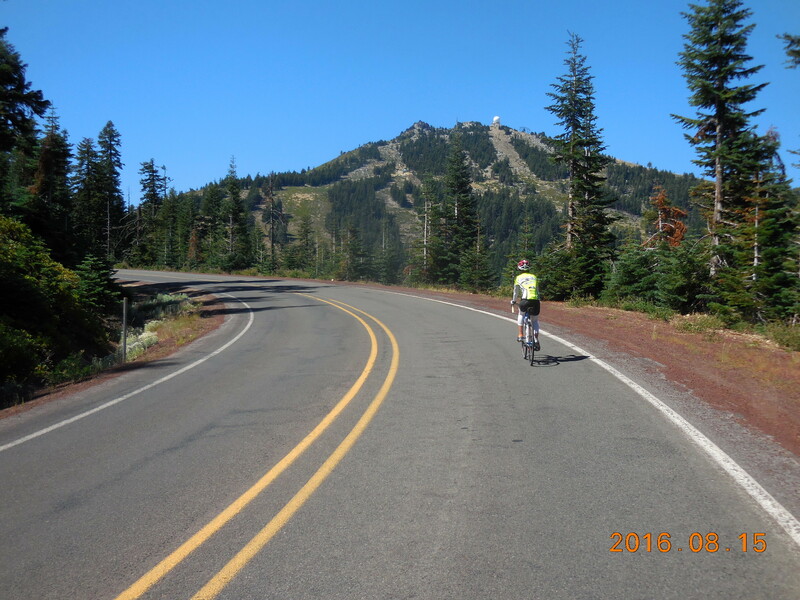 The climbing is never very steep and after about 18 miles you’ll reach the Mt Bachelor ski area. Continue along the Scenic Byway with lots of descending and flat riding for more than 20 miles. Just after MM 44 (or where MM 44 would be if it existed), in a long straightaway, you’ll see signs for FS Road 40 and Hwy 97 pointing to a road heading off to the left. Turn left and ride the generally flattish road for about 15 miles to the T-junction. Turn left towards Mt Bachelor (15 miles) and Cascade Lakes Byway (11 miles). Once you reach the Scenic Byway turn right and descend back to Bend. In southern Oregon, Ashland is nestled where the plains meet the hills. Its “crown jewel” is Lithia Park, right next to the lovely little downtown area. Ashland is well known for its Shakespeare Festival which runs from February through early November. If you are interested in attending it’s worth booking early as the cheaper seats sell out fast. Here’s some information about cycling in the area. And here’s a PDF of the Ashland Map Guide. You can also get a Jackson County Bike Map at most local bike stores – I like it because it shows gradient indicators. 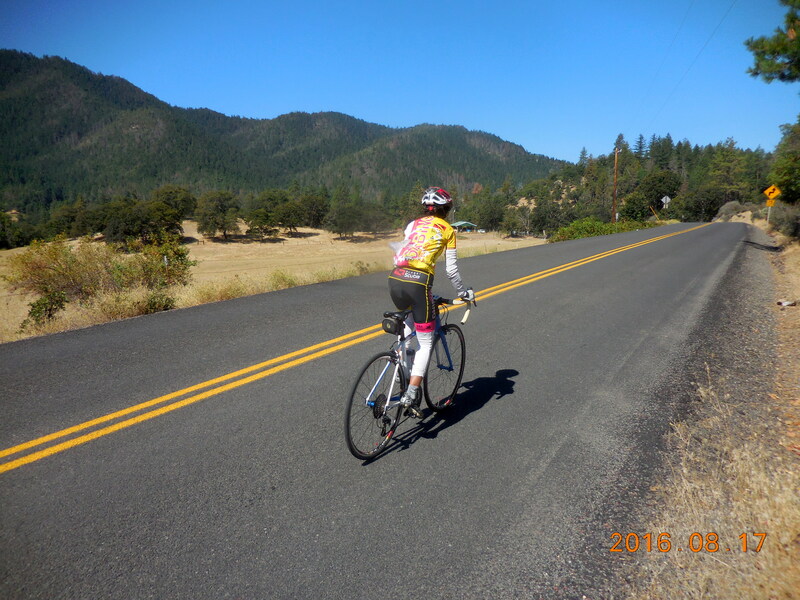 Another resource is Siskiyou Velo, which shows various rides in the area. 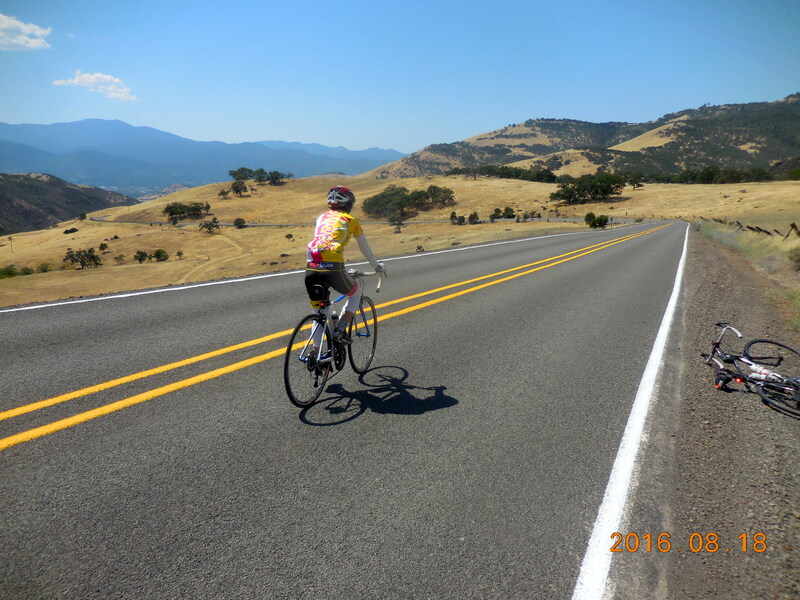 A two part climb, the climb to Mt Ashland is 16.8 miles long and climbs 4,308 feet. The roads are pretty good, although there’s no shoulder, and traffic is light. From the bridge where I-5 crosses Hwy 66, drive or ride 5.1 miles east on Hwy 66 to Old Siskiyou Highway (also known as Old Highway 99 and Hwy 273) on the right. At 6.7 miles you cross under I-5, turn left, and in about half a mile turn right up Mt Ashland Road. Climb more steeply up to the Mt Ashland ski area then ride past the ski area more easily for a few hundred yards to where the road turns to dirt. Finally an Oregon climb that has views! I was getting bored with riding up roads through monotonous viewless forests, and was looking forward to seeing something more interesting and varied than endless trees. Dead Indian Memorial Road is 12.6 miles long and climbs 3.308 feet as it goes through open fields then through scrub oaks, and finally through pine trees in the upper section. About 0.6 miles from the bridge where I-5 crosses Hwy 66, Dead Indian Memorial Road heads off to the left, easily at first, then considerably harder in the final third. It ends at a very obvious unmarked summit with a Sno Park on the right. The road is good although it has no shoulder, and traffic is pretty light. 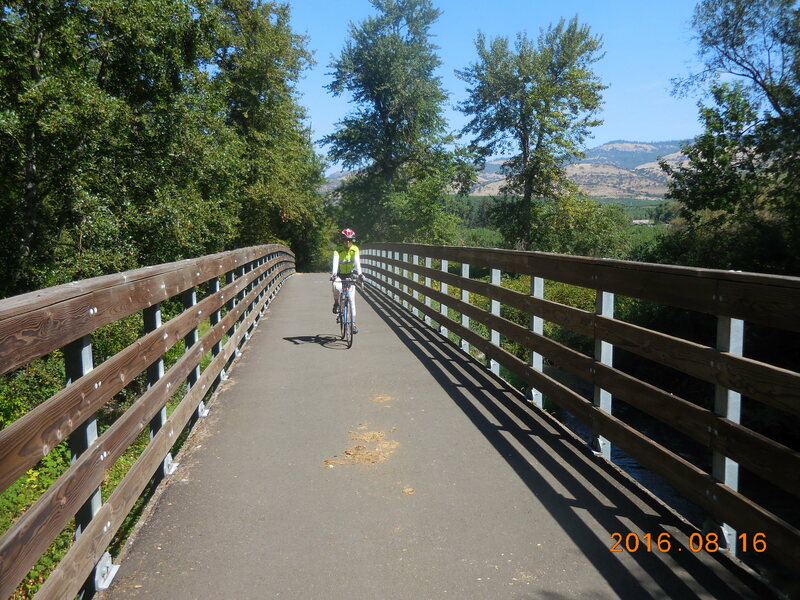 An easy ride along a bike path that heads north through Medford to Central Point. It’s about 20 miles long (one way) and parallels I-5. Strangely, the mile markers are off by about 5 miles because the original intention was to continue the path another 5 miles to the south, and the mile markers reflect this. Perhaps one day the extra 5 miles will be built…..
To get to the Bear Creek Greenway, follow Oak Street north to Nevada Street. Turn left and join the path at the Ashland Dog Park. Some of the best riding is around Jacksonville, which is about 17 miles NW of Ashland. In fact if we come back to this area we’ll probably stay in Jacksonville rather than Ashland. Drive up to Jacksonville and follow the signs for Public Parking. You’ll be directed to a huge parking lot in the center of town. There are many ways to do this ride and I’m describing the one we took. It’s hilly on the way out, and easier on the way back. Traffic is pretty light except for the stretch on Hwy 238 on the way back. The ride as described is 52 miles long with 3,700 feet of climbing. Leave the parking lot and you’ll be on N. Oregon Street. Cross California Street (the main street) and continue on S. Oregon. Follow this road as it becomes Applegate St then Cady Road. It get steep very quickly so you are faced with an immediate climb out of town. About 1.8 miles from California St turn left on Sterling Creek Road. Follow this as it descends then climbs again until at 12.6 miles you reach a T-junction. Turn right on Little Applegate Road an ride this for 3 miles to the T-junction at 15.6 miles. Turn left on Applegate Road and ride this to the dam and Applegate Lake, which you’ll reach at 27.6 miles. Just after MM 14 you start the almost mile long climb to the top of the dam. Suitably refreshed, climb back out to the road and head back to the dam and back along Applegate Road. Continue along this road to the little town of Ruch, and the intersection with Hwy 238, which you reach at about 45 miles. Hwy 238 is considerably busier than what you’ve been riding, but it has a very good shoulder. Continue up 238 for about 5 miles to the top of Jacksonville Hill Summit then turn right on Cady Road. Climb the short climb to its top then descend the road that you started the ride on. Ashland’s classic loop ride. It’s only 46.6 miles with 4,420 feet of climbing, but feels bigger and longer. Well worth doing for the views on the climb up Hwy 66 and the descent down Dead Indian Memorial Road. Obviously the loop can be done in either direction but the most popular direction is counter-clockwise. The roads surfaces are good and traffic is light, which makes this a wonderful ride. Start at the intersection of Hwy 66 and Dead Indian Memorial Road. You can ride here from Ashland (which will make the ride longer) or park on Wedgewood Lane, just before you get to Dead Indian. Follow Hwy 66 south then east for 16 miles. The first 7 miles are rolling, then the real climb starts and continues for the next 9 miles. At mile 16 turn left onto Hyatt Lake Road, opposite the Green Springs Inn. Follow the road, steeply uphill at first, then rolling and flat past Hyatt Lake. At mile 20.4 you pass cabins and a store where you can buy food and drinks. At mile 24.7 turn left following signs for Dead Indian Memorial Road. At mile 29.6 you reach the T-junction with Dead Indian Memorial Road. Turn left and climb gently for 4 miles to the top of the climb, which you reach just after MM 13. Continue down the wonderful descent to where you started.